A Moroccan student hands an independent evaluator from Mathematica Policy Research the block he has selected from the bag. It was as straightforward as pulling a name out of a bag. This was the approach recently used by the Government of Morocco and the Millennium Challenge Corporation in choosing which middle schools and high schools in the Fez-Meknes and Marrakesh-Safi regions would receive a newly developed secondary education program. The Government of Morocco, in partnership with Millennium Challenge Corporation (MCC), has developed an innovative program to address issues associated with the employability of youth in the country, which includes an activity that focuses on improving the learning environment for secondary students. With a budget of more than $100 million, the strategy incorporates such elements as a more inclusive process for determining local school priorities, giving more responsibility and autonomy to each participating school, improved school infrastructure and equipment, and developing student-centered education programs. The program is expected to benefit 100,000 students in Morocco, including nearly 50,000 adolescent girls. A Moroccan student reads out the number corresponding to a particular school on the block he has selected during the lottery. 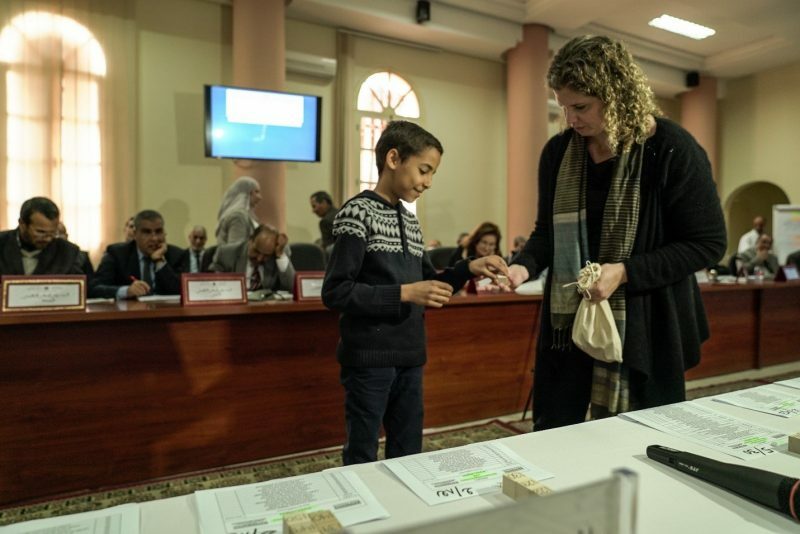 The Moroccan education system has been gradually improving in recent years, with great strides being made to achieve universal primary education and increased enrollment in secondary schools, as well as improved literacy throughout the country. Data in 2012 reveals that 91 percent of youth between the ages of 15-24 were literate, a dramatic increase from the corresponding statistic in 2008, when only 78 percent of the same demographic could read and write. Despite this progress, the country still struggles with high secondary school dropout rates. Only 15 percent of Moroccan first graders will go on to graduate from high school. This situation, paired with Morocco’s recent push to diversify its economy and include more complex industries, has ultimately led to frustration amongst employers who are unable to find personnel equipped with the skills needed to work in these fields, as well as increasing frustration from unemployed youth who are unable to find jobs. 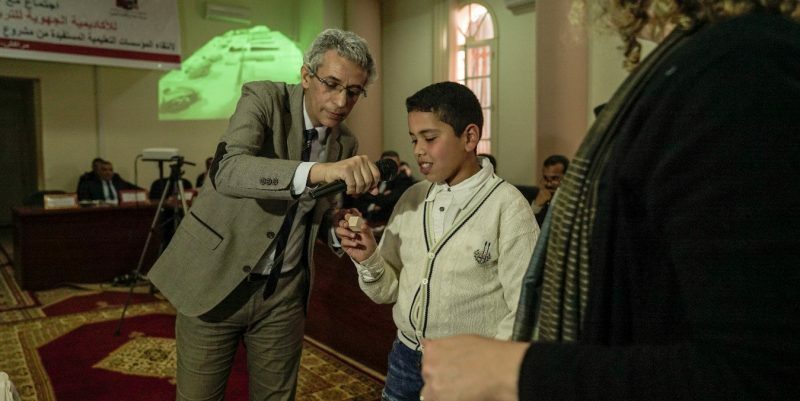 In March, the Government of Morocco and MCC hosted lotteries in the two regions to choose the schools that would benefit from the program. Representatives from the Moroccan government and MCC attended the events, along with students, teachers and parents from the regions. These were the last two lotteries for the program, with the first selection event taking place in Tetouan in December 2016. The selection process, as noted above, was straightforward: each eligible school was assigned a number, which was recorded on paper and also inscribed on a wooden block. Once all the blocks had been assigned to each school, they were placed inside a bag. Students themselves were amongst the individuals to draw from the bag to select the schools, a feature that reflects the nature of this program in allowing students, along with their parents and communities, to play a more hands-on role in their schools. 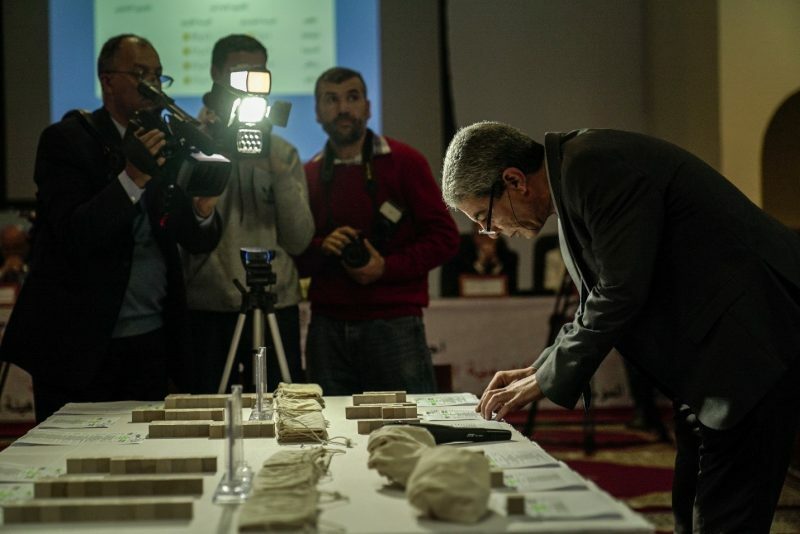 While different techniques for the choosing of schools were considered, the teams from the Government of Morocco and MCC decided that the old-fashioned way, drawing a school at random from a bag, was the most fair and transparent method to conduct the selection process. The schools were selected from a pool of eligible schools in eight provinces, with a balance maintained between rural and urban schools as well as middle schools and high schools. An official matches the number on the block to a list with the corresponding school. Ultimately, 28 schools from each region were chosen. In total, 90 schools in the Tangier-Tetouan-Al Hoceima, Fez-Meknes and Marrakech-Safi regions have now been selected to receive the program. This program is part of a broader investment, undertaken by the Government of Morocco and MCC, to improve the quality of education and increase economic growth in the country. Other components of the investment include the creation of technical and vocational training centers governed by public-private partnerships and the facilitation of land productivity in the country. When students are given the skills they need to succeed in the economy, sustainable change can occur. MCC’s mission to reduce poverty through economic growth undergirds our efforts to boost education in Morocco and that is something we, the Moroccan government, the private sector and all Moroccans can be proud of.